Hiring departments, managers, and employees will work with UCPD on this process. The University maintains a Background Check policy which has been in effect since April 2, 2004. The policy for PPSM-21 Appointments provides details on background check requirements. View the HR Appointment Document at UCOP. To protect the campus community and its assets, the University needs to ensure that individuals assigned to certain campus positions have no history of criminal behavior relevant to their employment. Positions deemed "critical" by Human Resources (HR) require background checks. Employees who have been employed in critical (formerly "sensitive") positions since before 2004 and have not had a break in their service or a change in their position are not affected. Transfers, promotions, reclassifications, reassignments, and new hires are subject to the policy. What is the procedure to arrange a background check? Complete and deliver four documents to UCPD Records Unit at the time of the appointment. Each applicant must have their own set of documents. The documents should be provided to each applicant for them to deliver in person at the time of fingerprinting. If you e-mail the documents to the applicant, please insure they know to print out all the required attachments before coming to UCPD for fingerprinting. UCPD is not responsible for printing out these documents for them, and failure to bring the required paperwork may result in a rescheduling of the appointment. Employee/Applicant Release and Disclosure Form (102 KB, PDF). For Controlled Substances Release and Disclosure Form click here. The Request for Live Scan Service Form (14KB, PDF). Hiring departments must fill out Sections 1, 2, and 4 of each form. Instruct each employee/applicant to fill out Section 3 of their form. Give them the form to bring with them to UCPD. IOC (Interdepartmental Form/formerly "Interoffice Chargeback") for payment. (Forms found at the Controller's site.) Please ensure the IOC is signed and is for the correct amount. UCPD will be unable to perform the fingerprinting if IOC is incomplete or incorrect. The rate as of July 1, 2018 is $101.00 for campus departments and $113 for non-campus departments, and is listed on UC Police Services Recharge Rates Page. (http://budget.berkeley.edu/uc-police-services-recharge-rates) For more information about Recharge, see the Controller's recharge page. Job Description — A description of the job the potential employee has applied for. 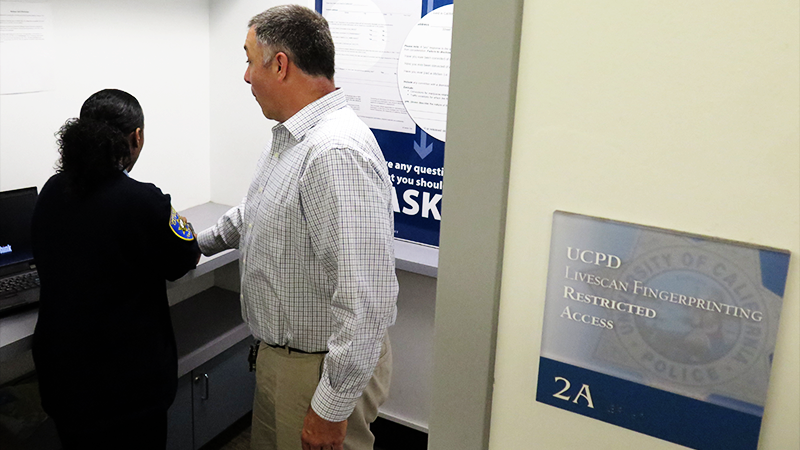 Your hiring department will make the appointment for your fingerprinting at UCPD or provide you with the number to call to make the appointment yourself. The hiring department should provide you with all four documents as listed above before your appointment. The State of California Department of Justice usually sends results to UCPD within 7 business days. The FBI usually takes 30 days. UCPD will receive the entire criminal history or record. Please note: juvenile offenses and certain other convictions may be sealed by the courts, and will not by sent to UCPD. UCPD will send a letter of the results to every person fingerprinted. The letter will be sent immediately if there is no criminal history. If a criminal history is reported, the results are sent to the UC Background Check Review Committee for review and a summary of the history they will review will also be mailed to the address the applicant provided on the Live Scan Request form. The committee will decide if the criminal history disqualifies the employee/applicant from the position or new duties. The committee will inform UCPD of decision, then UCPD will inform the department and the individual in writing of the committee's decision. Q: "What is the campus practice regarding transferring an employee from one critical position on campus to another?" A: Previously cleared employees transferring into another position designated as critical must gain a separate approval from the Review Committee for that new position. Hiring departments may e-mail or call UCPD to begin the process. UCPD will request a job description for the new position only if there are significant changes to the assigned duties, and will ask for the employee's name and date of birth to help identify their records, and initiate the review process and will let you know if any follow up is required. UCPD will respond by e-mail stating whether the applicant has been transferred, needs to be fingerprinted, or is denied. Q: "What happens if the department receives a Background Pending e-mail?" A: From time to time the DOJ or FBI will need more time to provide the results of the Live Scan and will send a delay notification to UCPD. UCPD will send an e-mail to the department listed in section 2 of the Live Scan Request form informing them of the delay and ask four follow up questions for the department HR to answer. Once the DOJ or FBI provide the results, they will be processed by the UCPD as discussed above. Q: "What happens if the department receives a Background Redo e-mail?" A: From time to time the DOJ or FBI will reject the Live Scan based on poor quality of the prints and will send a notification to UCPD. UCPD will send an e-mail to the department listed in section 2 of the Live Scan Request form informing them of this and requesting the applicant come in to be re-fingerprinted at no extra cost to the department. The DOJ and FBI require two attempts be made to obtain quality fingerprints acceptable to their standards before UCPD can request the background information through other means. Once the DOJ or FBI provide the results, they will be processed by the UCPD as discussed above. Office of Human Resources' website under “Other University and campus policies”.